The Royal British Legion is the national custodian of Remembrance, a role which ensures that those who gave their lives for peace and freedom are remembered. The act of observing a Two Minute Silence began in 1919 following the Armistice at 11 am on the 11th November 1918 at the end of the First World War. In 1921, the year the Legion was formed, ‘Armistice Day’ was formally adopted as the national day of Remembrance and the Legion was charged in its Royal Charter with organising “Festivals of Remembrance, services and parades to perpetuate the memory of sacrifices made during service with Our Armed Forces in war and peace”. The annual Poppy Appeal. Every year the Legion mobilises a countrywide network of Poppy Appeal collectors to meet the enormous public demand for poppies – the nation’s symbol of Remembrance. 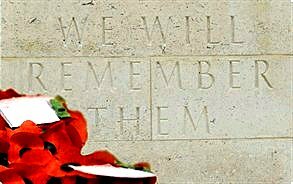 The Two Minute Silence at 11 am on 11th November when the nation pauses to honour those who gave their lives for peace and freedom. The Legion has been instrumental in reinstating this in the nation’s calendar. The annual Festival of Remembrance. Every year the Legion organises a festival at the Royal Albert Hall to pay tribute to all those who have given their lives for our peace and freedom. The Parade and Service at the Cenotaph in Whitehall on Remembrance Sunday organised by the Government and the Legion. Remembrance is not just about those who fought in the two World Wars of the last century, but also about those involved in the many other conflicts worldwide since 1945 and those still fighting for peace and freedom now. It is also about learning from the past and resolving to make the world a better place to live in the future.